I've been on a bit of sewing kick lately. I first unpacked my sewing machine in order to line the Wee Lass's curtains so they'd block the light better during naps. Then I received a fabulous baby quilt for the Wee Lass and couldn't help but be inspired. Having a baby has been giving me lots of ideas for things to make, but not a lot of time. My sewing tends to happen in many small increments over naptimes. 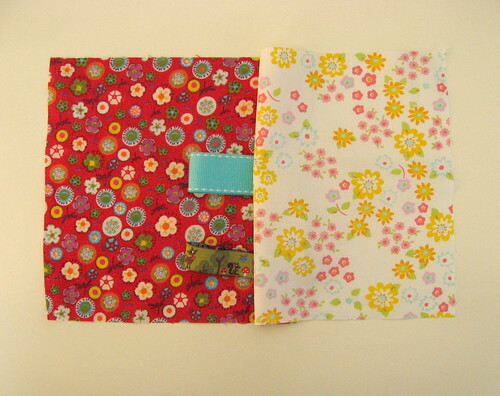 So far, I've made a fabric book and a tag square toy. 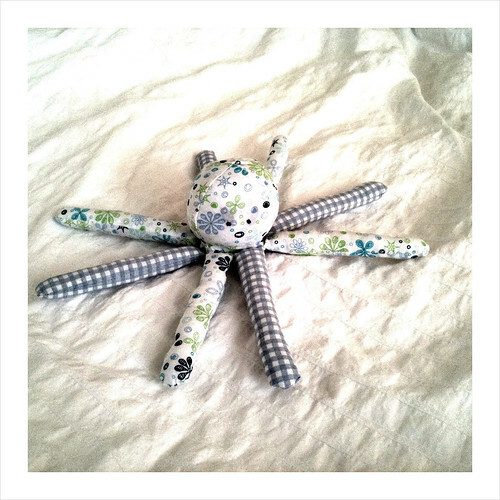 The latest project is this octopus. This is actually a prototype as I'm still working out the pattern and construction. I may (eventually) post a tutorial once I refine it. The end result is still pretty cute though and the Wee Lass definitely enjoys chewing on it. 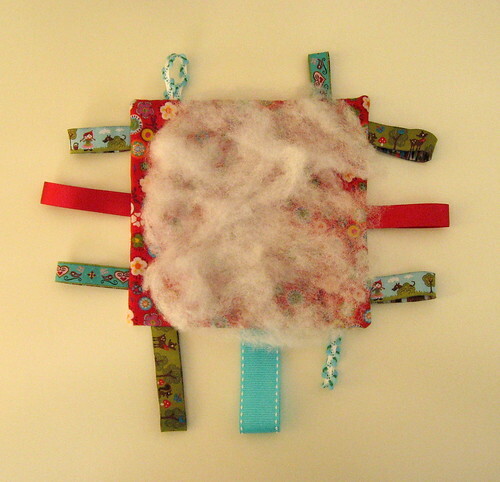 The ribbon for the snap closure on the fabric scrap book is the Wee Lass's favourite bit to chew, so I thought I'd make a snap-free tag square toy. Before I had a little one, I'd have wondered how this scrap of fabric and trims could be interesting, but really, anything with bits to hold and that she can put in her mouth is currently a popular toy. Conveniently, it's a project you can finish during a single naptime. 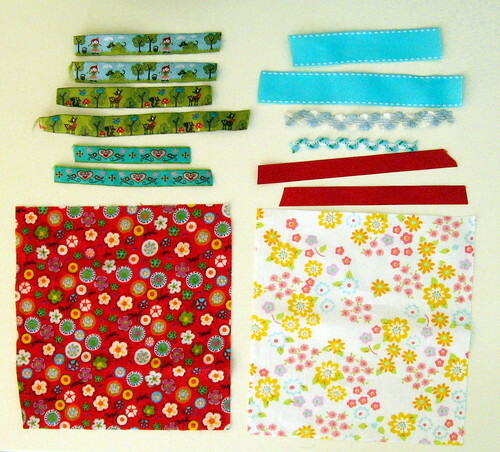 Cut various lengths of trim, ribbon, or strips of fabric to form your tags. If you're using strips of fabric, you'll need to finish the raw edges somehow so that they don't fray during the no-doubt-frequent washings (or sew little tubes so the raw edge is inside). Fold each tag in half (with the right side facing out), and pin in between your two squares of fabric (with right sides of fabric together). I did 3 tags per side. Leave a good bit of space near the corners to account for the seam allowance and don't pin the tag(s) in the middle of one side, so that you have a gap for flipping the whole thing right side out. Sew around your tag square, leaving a good gap for turning. Strongly backstitch on either side of this space. I also backstitched over each tag, to ensure that they were extra secure. 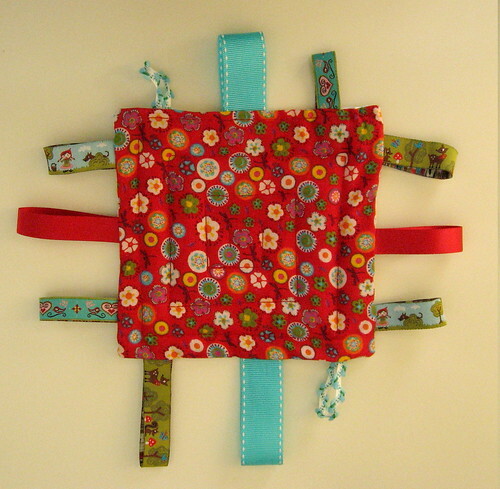 When you're finished sewing, turn your square the right side out, and iron it flat. Now you need to stuff your square. Take a small bit of filling and stretch it out thinly until it's nearly the size of your square. Then stuff it inside and spread it out. 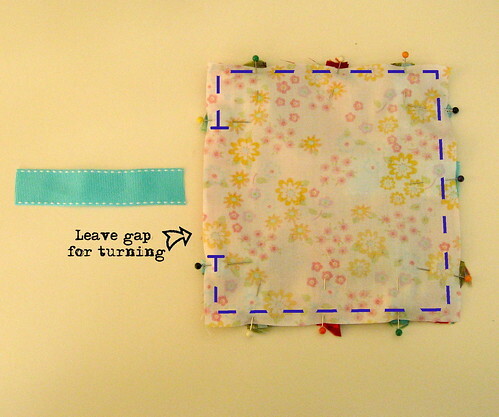 Now pin the tag(s) that you left off from your gap for turning, and sew them to one side of the opening. Now that they're fixed in place, quilt your square. This will hold the batting in place. 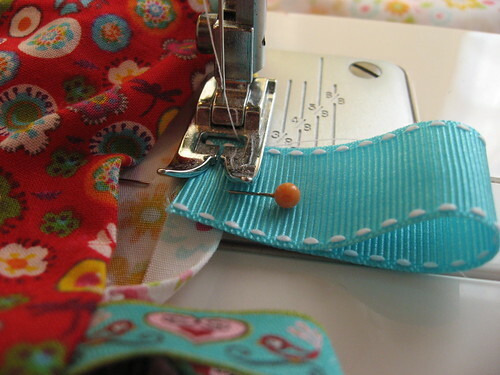 Make sure that you run at least one line of stitching down along the opening to close it up. I used a square spiral pattern, working from the middle out. That's it! I wondered whether it was worth writing a tutorial for this at all since it's super simple, but I figure that beginners, tired new parents, or parents-to-be might find it helpful. 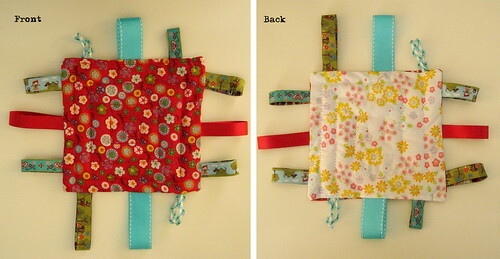 If you make a tag square baby toy inspired by this tutorial, I'd love to see it! Please add your pictures to my flickr group.